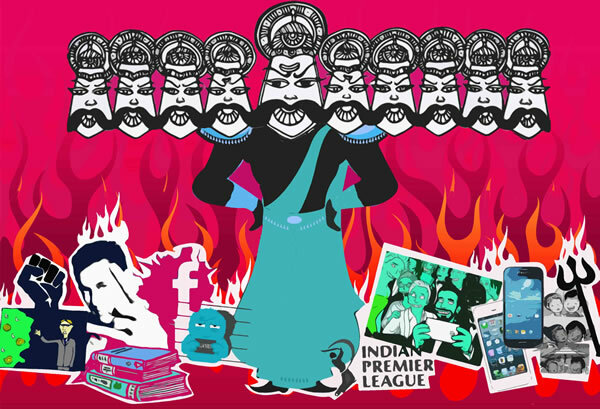 Verve gives you a list of 10 pet peeves to ‘burn’ this Dussehra. How many do you agree with? 2. The IPL: The first edition was a thing of beauty. Rajasthan Royals, the underdogs, beat Chennai Super Kings to clinch the trophy amidst truckloads of drama and entertainment. It goes downhill after that. Too many controversies and a jumping jhapaak song later, we’re sure we’re done with the drill. 3. Indian authors and their books for the masses: How will we masses know anything other than pithy romances and make-believe mythology if that’s all you give us? We demand mystery, magic realism, war, fantasy and dollops of humour. We demand better. Burn the midnight oil, dear authors (like you did when you were studying for that IIT paper). 4. Rain and rain-related news: Day 1 – Biggest drought in the history of the country. Day 2 – Rained through the night. Ocean’s overflowing. We’re one big happy family. Mr. Frog and Ms. Guppy have gone swimming in the Juhu potholes. Let me see. Monsoon. Must fill pages. Must create an intro-conflict-happy ending. 5. Wedding and honeymoon albums on Facebook: We understand you want to change your profile photo. Share that happiness. But uploading a whole album with tags and hashtags and captions? Honeymoon pictures take the cake. We’re glad someone’s going on a journey, but do not want to indulge in a voyeuristic relationship with the couple. 6. Smart phone wars: There’s always going to be a thinner, sleeker iPhone every year. ‘But Android always had those functions yaar.’ ‘HTC has a better camera.’ ‘Sony’s music trumps all.’ ‘I can’t live without BBM and everyone knows it’s got the best reception on a Blackberry.’ ‘But I think I’m going to sell my brother and buy an iPhone.’ Whatever your decision, nobody cares anymore. Unless you’re bringing back the beloved Nokia 6600. 7. Social media split personalities: Your Facebook page shared The Hindu’s article supporting Deepika Padukone while your Twitter feed states ‘Finding Cleavage 😉 😉 😛 LOL Haha #ReplaceMovieNameWithCleavage.’ Seriously? 9. Political misinformation: Oh, we love KRK’s tweets. And AIB’s sketch on the Congress-BJP rivalry was a lark. Those guys have done their homework and possess the sanction to disregard. What’s our excuse? ‘But I must vote for AAP because Vishal Dadlani votes for them.’ And that’s the future of our country, right there. 10. Stop time, because religion…: ‘Can’t get out of the house this week. Diwali.’ ‘Let’s do Christmas vacation in Goa.’ ‘Aye today Mumbai bandh. Visarjan day.’ ‘My office doesn’t give us a holiday for Meerabai Jayanti. My religious sentiments are hurt.’ We love the holidays, but hate all the stalling. Er…mithai, anyone?